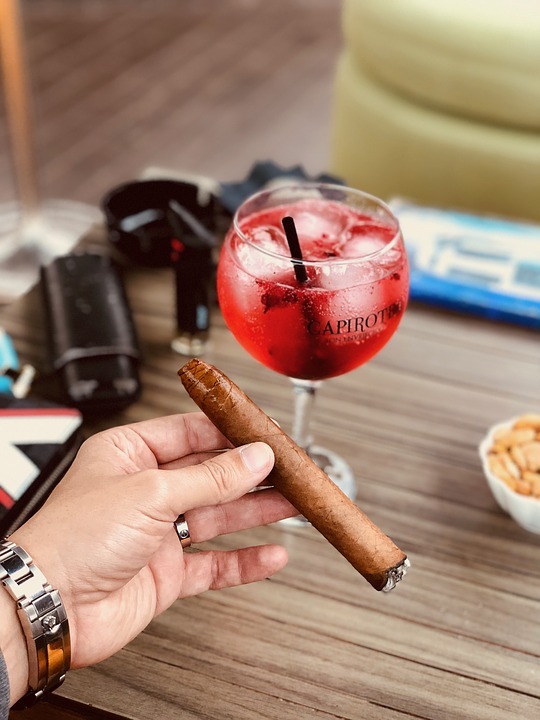 If you are new to cigar smoking, you may have noticed that cigars come in varying sizes and shapes and that smokers spend different amounts of time on the kind of cigars they smoke. The diameter and length of a cigar can vary from brand to brand, making it important to describe a cigar by these two dimensions. The length of the cigar is given in inches while the ring gauge is a designation for the diameter of a cigar, broken into 64ths of an inch. A cigar that has a 42 ring gauge simply means that it has a diameter of 42/64th of an inch. It is important to note that there is no correlation between the size or shape of a cigar and its strength. You can have a long cigar, such as an 8-inch cigar, that is mellow because it is made of mild tobacco. On the other hand, you could have a strong cigar that is short because it is made of full-bodied and powerful tobacco. The tobacco determines the strength of a cigar, never the size or shape. Corona Gorda – The Corona Gorda is also known as a toro and is growing in popularity. It takes roughly an hour to smoke and traditionally measures from 5 to 6 inches with a ring gauge of around 46. The Traditional – This is the benchmark cigar size against which other cigars are measured. The traditional dimension of corona ranges from 5 to 6 inches, and they have a ring gauge range of 42 to 44. A corona takes around 45 minutes to smoke. The Petit – As the name implies, this cigar is a little bit smaller than the other two coronas, and it only takes approximately 30 minutes to smoke. It generally measures about 4.5 inches and has a ring gauge between 39 and 42. Double Corona – If you want to smoke one of these heavyweights, you’re going to need to block out a good two hours. They measure between 6.5 to 7.5 inches in length and sport a ring gauge of 48 to 49. Lonsdale – The classic measurement of a Lonsdale is 6.5 inches with 42 ring gauge which makes them longer than a corona but thicker than a panatela. It takes about 45 minutes to smoke one. The Churchill – A Churchill is a large version of a corona. The usual dimensions of this cigar are 7 inches with a ring gauge between 47 and 54. The Romeo y Julieta cigar is an example of a Churchill, which takes an hour and a half to smoke. Pyramids – Pyramids, as their name implies, are cigars with a cut foot and a head tapered to a point. The usual measurement is 6 to 7 inches in length and a ring gauge of about 52 at the foot, narrowing down to about 40 at the head. It can take up to an hour and a half to smoke one of these cigars. Robusto – A Robusto is a short, fat cigar measuring in at 4.75 to 5.5 inches long with a ring gauge of 50 to 54. This size is becoming increasingly popular here in the United States, and depending on how thick it is, each Robusto can take anywhere from 45 minutes to an hour to finish. Belicoso – The traditional Belicoso is a short pyramid, with a slightly rounded pyramid head. It often measures from 5 to 5.5 inches and about 50 ring gauges. Bolivar Belicoso Fino is a good example of this type, which takes about 45 minutes to smoke. Panetela – A Panetela is an elegant cigar whose popularity has significantly decreased through the years. Long and thin is its trademark look with dimensions ranging from 5 to 7.5 inches with a ring gauge of 34 to 38. Cigars that measure more than 7 inches are referred to as “gran panetelas,” and generally a panatela takes from 30 minutes to an hour to smoke. There are plenty of cigar variations, but the aforementioned cigar types are among the most common that you will encounter when you visit cigar bars.